Facebook said in a blog post on Wednesday that conversations with academics and civil rights groups convinced the company to expand its policies around hate groups. "Today we're announcing a ban on praise, support and representation of white nationalism and separatism on Facebook and Instagram, which we'll start enforcing next week," the company wrote in the post. "It's clear that these concepts are deeply linked to organized hate groupsand have no place on our services." Under Facebook's change, people who search for terms associated with white supremacy will instead see a link to the page of Life After Hate, a nonprofit that helps people to leave hate groups, the company said. The change was first reported earlier on Wednesday by Vice's tech publication Motherboard, which had previously found that Facebook's policies banned white supremacy but allowed white nationalism and white separatism. "Going forward, while people will still be able to demonstrate pride in their ethnic heritage, we will not tolerate praise or support for white nationalism and separatism," Facebook said in its post. Facebook has previously taken action in the wake of race-based violence, removing links to a white supremacist website and taking down a page used to organize the "Unite The Right" rally in 2017. Color of Change, an advocacy group that has called on tech companies to do more to fight racial hatred, called Facebook's decision a "critical step forward." "Facebook's update should move Twitter, YouTube, and Amazon to act urgently to stem the growth of white nationalist ideologies, which find space on platforms to spread the violent ideas and rhetoric that inspired the tragic attacks witnessed in Charlottesville, Pittsburgh, and now Christchurch," Rashad Robinson, president of Color of Change, said in a statement. A Twitter representative on Wednesday declined to say whether the company was considering adopting a similar change. Amazon and YouTube did not immediately respond to requests for comment. Twitter does not explicitly ban white nationalism, though its rules tell users they may not affiliate with organizations that "use or promote violence against civilians." Its rules also prohibit the use of "hateful images or symbols" in profile images, and Twitter says it enforces those policies vigorously and regardless of ideology. On Tuesday, Ime Archibong, Facebook's vice president of product partnerships, revealed some details about a new "Oversight Board" that the company is forming to provide guidance on the company's "most challenging and contentious content decisions" and "hold us publicly accountable if we don't get them right." "The board, as currently envisioned, will consist of about 40 global experts with experience in content, privacy, free expression, human rights, journalism and safety," Archibong wrote in a blog post. "Where we need to, we will supplement member expertise through consultation with geographic and cultural experts to help ensure decisions are fully informed." 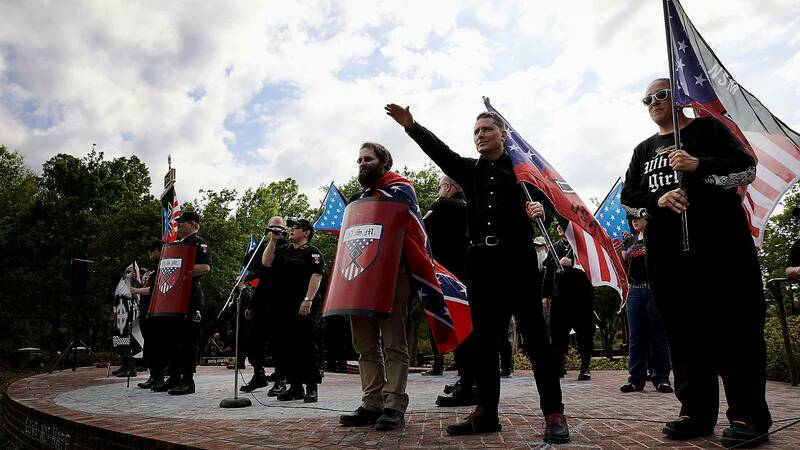 Some U.S. lawmakers want the federal government to do more to learn about the relation between online extremism and hate crimes. House and Senate Democrats including Sen. Bob Casey, D-Pa., haveintroduced legislation that would require the Justice and Commerce departments to study how people are using the internet to fuel hate crimes.